Following is a brief article from a dear friend and brother, Tom Lewis. He is relating a particularly amazing step in the direction of the restoration of all things! firstborn in a Pidyon HaBen ceremony. While it is a long story, he eventually found a rabbi willing to do it. More interestingly, this Orthodox Rabbi, Ariel Cohen Alloro, believes Yeshua is the Messiah and he can prove it many multiple ways. Ha El Avraham v’ Yitzhak v’ Ya’akov – baruch hu! The G-D of Avraham, Yitzhak and Ya’akov is doing mighty things across this world and through many peoples at this time in history. HE is moving amongst Christians and Jews alike … HE is molding hearts; opening eyes and ears and drawing HIS people back to HIS Torah and HIS Salvation – Yeshua, the son of the MOST HIGH Elohim. Most see the words I wrote in bold, “… and they will look to me whom they pierced.”, as applying to when HaMashiach, Yeshua returns physically to this earth. What about now or in the near future before HIS return? There is a man in the earth today … an Orthodox Jew … living in Yerushalayim … one who believes that Yeshua, son of the MOST HIGH Elohim, son of Mary of Beit’lechem, son of Daveed is HaMashiach … that is being moved upon. His name is, Ariel Cohen Alloro. He is being moved upon by the MOST HIGH Elohim to desire to bring Yeshua son of David, HaMashiach, back into the fold of Y’israel. He wants to be able to perform a Pidyon HaBen (redemption of the firstborn) for Yeshua to re-introduce HIM to Y’israel and the Jewish people. He wants to have Yeshua re-tried (in a public trial) before the 10 top rabbi’s in Y’israel because he believes that the first trial was illegal and nefarious. Now before I go any further … that which took place and happened to our Messiah had to happen the way it did for salvation to come as that free gift of deliverance. That aside … Ariel is not trying to negate anything that was done for US through Yeshua and ABBA’s plan. What he is seeking to do is have a re-trial for the world, Christianity and Judaism to see that Yeshua is that which we know HE is … HaMashiach who is echad (one) with HIS Father our ABBA. Ariel’s desire and hope is that at the very least to have a 5 to 5 split on the court – why? So, that then any Jew who believes that Yeshua is HaMashiach can state so openly and not be driven from the synagogue! Ariel has a website, Facing Each Other (a couple of links are provided at the end of this article). He plainly states all and is totally open in everything he says and desires to accomplish. He has many videos: discussions with various people and many teachings about HaMashiach,Yeshua. He needs help. You see, Ariel started on this mission from YAH in 2014. He has the backing of his Rabbi; he has spoken to many Christians and Jews. The Pidyon HaBen and Trial cannot take place until he has the proper backing from Christianity and us ‘Hebrew Roots/ returning to Torah believers’. I believe that now is the time for Ephramites/Torah observant believers/Hebrew Roots folks to stand up for a brother Jew/fellow believer and help him help his and our brothers see Yeshua. Please go to his website and get to know him. 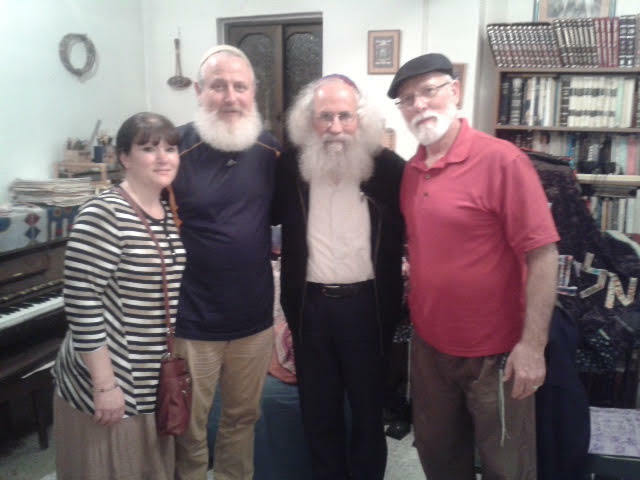 My wife and I and a friend of ours spent 4 hours in his home during Pesach 2017. He is a kind and gentle man with much love and understanding of and for Ha El of Avraham v’ Yitzhak v’ Ya’akov; HIS Torah and our Salvation, Yeshua. Blessings in and through Yeshua. This entry was posted in A Thought..., Guest Post and tagged Ariel Cohen Alloro, Facing Each Other, Pidyon HaBen, Redeeming the Firstborn, Redeeming Yeshua, Tom Lewis. Bookmark the permalink. 1 Response to Redeeming Yeshua…. Thanks Pete for sharing this…I look forward to sharing it with others! I love hearing how Abba is connecting His children! Shalom shalom!